A premixed one-pack, water based, brush/roller applied, acrylic membrane, which when cured becomes a tough elastic heavy duty UV resistant waterproof membrane. 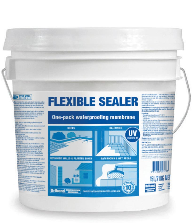 A waterproofing membrane applied prior to tiling on wet areas (bathrooms, shower alcoves, laundries) and tiled over or exposed on balconies and roofs. Apply to properly prepared concrete, cement render, masonry brick/block, screed and building board ie: cement, gypsum, compressed cement sheets.